We have teamed up Bloggin' Mamas and Gugu Guru to share The Ultimate Gugu Guru Eco-Registry Picks Giveaway! Gugu Guru is your very own personalized baby registry. 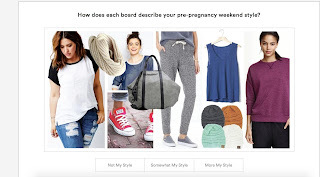 Gugu Guru is an online personalized baby registry that finds and delivers perfect matched products based on a mom’s unique lifestyle and personal style. With thousands of baby products on the market it can get extremely overwhelming trying to figure out your baby registry. The last thing any mom-to-be needs is stress! 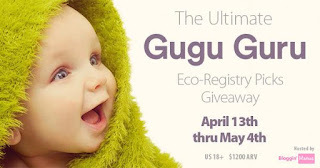 Gugu Guru’s team of baby gear experts and in the know moms created Gugu Guru to help define your lifestyle needs with the very best products you’ll need for your baby’s first year of life. Their edited list of baby must-haves is tailor made to your lifestyle—not your best friend’s. Think of them as your very own personal shoppers for your baby registry. Kick up your (swollen) heels and let Gugu Guru do the heavy lifting. What’s your baby registry style? Discover it with Gugu Guru! No more walking around stores drowning in a sea of baby products or spending hours researching online. 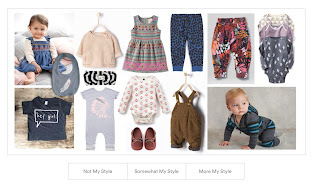 Gugu Guru is a new baby registry website that makes personalized product recommendations based on your unique lifestyle and personal style. Take a quiz and tell Gugu Guru about your lifestyle, the clothing and décor styles that appeal to you, along with your product preferences and Gugu Guru will deliver "perfect match" product recommendations so you can build your own highly personalized baby registry. 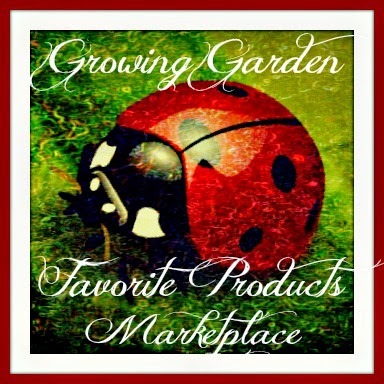 Products recommended range from the classic brands to new and undiscovered favorites. All Gugu Guru recommendations are always completely unbiased; based on ratings from industry experts and fellow moms in the know. You can browse recommendations, add products to your registry and then mark items as “Must Have” or “Nice to Have” to help your friends and family decide what to purchase first. Have something in mind not in your recommendations? Gugu Guru allows you to add a product from any website. When you're all done with your registry, select the option to have a Gugu Guru team member review before publishing or just go ahead and publish it to share with your friends and family so they can start shopping. It's fast, easy and fun! Step 1- Discover Your Registry Style Answer some questions about your lifestyle, personal fashion sense and product preferences. It’s fun. We promise. 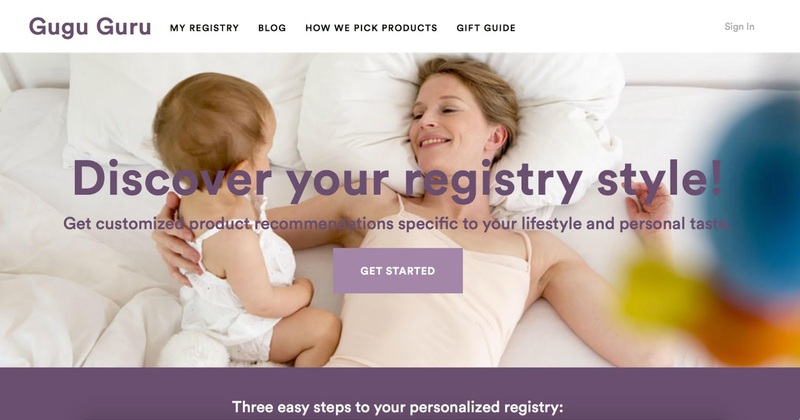 Step 2- Get Product Recommendations Gugu Guru will crosscheck your answers with their database of product ratings from industry experts and fellow moms in the know and then deliver you their unbiased, personalized registry suggestions. Say “bye bye!” to the products you just don’t need. Step 3- Build Your Registry Add products to your registry and select the option to have a Gugu Guru team member review before publishing or go ahead and publish it to share with your friends and family so they can start shopping. 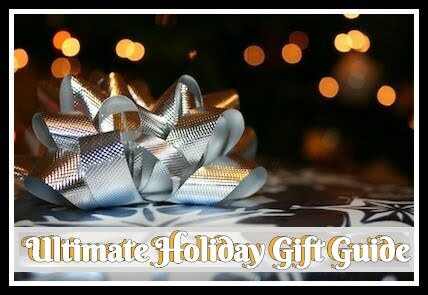 Sit back and enjoy receiving amazing gifts for you and your new baby! - Zoocchini- $11.99 at Zoocchini – These fun new animals: elephant, giraffe, whale, owl, and turtle, are soft, shakable friends - all packaged with recycled materials. - Babyganics- Dryer balls $19.99 for 3, 35oz detergent $9.00- both at Target- Each natural wool dryer ball can be used for 1000 washes and reduces drying time by up to 25%. Wool naturally softens fabrics and reduces static, an earth-friendly alternative to traditional fabric softener sheets. - Newlie- Gail Satchel Diaper Bag- $106 at newlie.com- vegan leather and complete with 1 exterior pocket and 7 interior pockets, and a roomy additional interior center pocket divider. Our signature insulated pocket is perfect for bottles during the diaper years and then to snacks during the toddler years. - Comotomo- $23.99 for the 8oz 2 Pack at Buy Buy Baby. - Finn + Emma- ($50 GiftCard) Organic baby clothes, playgyms, teethers, toys & playmats made from organic cotton & wood. Eco-friendly, Non-Toxic & Fair-Trade. - Lorena Canals Rug- (1 Rug: $200+ value) Most rugs on the market are made with toxic chemicals and environmental hazards. Lorena Canals Rugs are happy eco-rugs for your floors, free of toxic compounds and chemicals. Stylish and handmade in India, they are washable, all-natural, hypo-allergenic and functional. - DockATot- ($180 value) The ultimate baby registry item. Baby-lounger and co-sleeper handmade in Europe with 100% Okeo-Tex Certified materials and cotton with fair trade practices. - ShopBinxy- ($50 value) The perfect shopping companion for your organic grocery trips to Wholefoods, etc. - Bambo Nature- $75 Value - One case of eco-friendly diapers. Super-soft and absorbent diapers are produced with sustainable and eco-friendly manufacturing processes, while ensuring they are free of harmful chemicals and perfumes to minimize the risk of allergies and diaper rash. - Baby K'Tan- $59.95 - The Baby K’tan ORGANIC Baby Carrier is made of a soft 100% natural GOTS certified cotton, keeping baby close to your heart comfortably and naturally without any wrapping or buckling. 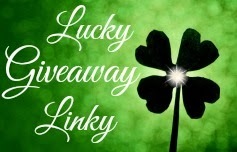 Disclosure: This blog didn't receive any compensation for the posting of this giveaway. Bloggin’ Mamas is not responsible for prize fulfillment or shipment, neither are any of the bloggers involved in this giveaway. This giveaway is in no way affiliated, endorsed, or associated with Facebook, Twitter, Pinterest, Instagram, or any other social media outlet. I like diapers because you can never have too many. We have a new baby in our family so a diaper bag is a must. The Newlie- Gail Satchel Diaper Bag looks really good to me and would be perfect for my daughter-in-law. One of my must have baby registry items is a diaper bag because I need a bag big enough to carry all of the items needed when I leave the house.